I have always felt that the British were slightly obsessed by anniversaries, particularly if it involves anything to do with the two world wars. It seemed unhealthy, perhaps encouraging beliefs that should have died with our empire. And perhaps more generally it encourages an unhealthy nostalgia. One of the clear dividing lines in the EU referendum between those voting Leave and those voting Remain was how they felt about the past. Asked if life in Britain was better or worse than it was 30 years ago, those voting Remain had a 46% balance saying better, while Leave voters had a 16% balance saying worse. While those on the left tend to see this as a protest by a working class left behind by de-industrialisation, it was also a protest by social conservatives who like to think of England as cricket on the village green. The Brexit vote takes us back not to the 1970s when we joined, but back to the 1950s. Britain first tried to join the EU in 1961, but was rebuffed by De Gaulle in 1963. Theresa May’s call for the return of Grammar schools (selection into different schools at the age of 11) also takes us back to the 1950s. One of the major achievements of the Labour government of the 1960s was to largely phase out selection at 11. The pretext May uses for reintroducing grammar schools is that it will help increase social mobility. The evidence is clear: it does not. A few local authorities did manage to retain grammar schools, and the evidence from them is also clear. The following graph is taken from a post by Chris Cook. FT points are a measure of educational attainment. The graph clearly shows that while the very rich might do slightly better in areas where grammars remain, the poor do very much worse. In short, reintroducing grammar schools is simply reactionary. We are going back to a time where class divisions were far more entrenched than they are now. It is possible that this can be avoided, but it requires those in the Conservative party who prefer living in this century to the last to say no to their Prime Minister. They could not stop the UK voting for Brexit, but they can stop this. That chart is seriously misleading. Anyone looking at it would assume that it shows that selective schools deliver a worse performance for around half of the pupils in their catchment area (the left side of the x-axis). That is not the case, for two reasons. 1 Areas with selective schools have higher incomes and so their pupils will lie mostly on the right of the x-axis. 2 The charts probably do not compare like with like.I would suspect that the groups of a given social deprivation index are quite diferent. I am genuinely agnostic on Grammar Schools but I have to agree that the graph is not convincing. It's not obvious that the control group should be "rest". A proper counterfactual would use similar counties: Essex or East Sussex vs. Kent, for example. One problem with using "all" is that we know that London in particular has some very highly performing schools. The reasons why are not well understood (though I remember seeing a reasonably convincing paper linking it to immigration). Whatever the reason, this would cause a positive shift in the intercept of the pink line compared to a "true" counterfactual. "Areas with selective schools have higher incomes and so their pupils will lie mostly on the right of the x-axis." One of the main retainers of grammar schools is Kent. Parts of Kent are undoubtedly wealthy. But many other parts are undeniably very poor. Overall, outcomes in Kent are poor by national standards. If, as you suggest, Kent is wealthier than the national average, then those results are even worse. James, I'm afraid I can't see how you can say the chart is " seriously misleading". I saw it and did not infer that around half of kids in selective catchments are worse off than comprehensive areas - as you say, there isn't enough information in the chart to make that conclusion. But it is clear that overall poorer kids do worse in selective areas. You accuse it of not comparing like with like, but that's exactly what it's doing. That may be because the two groups of poor children are different and nothing to do with the education that they receive. We have a Government with a small majority. Its MPs are divided on a number of issues , including this one and the conditions of Brexit so clearly Labour should be planning very seriously to defeat them on grammar schools and keep them to their promises over Brexit. This is vital not only for the good of the country but the health of the Labour Party. Assuming Jeremy Corbyn wins he should appoint a very high profile Shadow Leader of the House who commands the confidence of MPs to coordinate Labour's Parliamentary tactics. Owen Smith might be a good choice and would help to promote the unity we so desperately need. Agree with the primary content of this completely. This is just a small comment on the remarks about the Leave constituency. I don't think anyone credible has ever claimed Leave won due to a single group, be they the "precariat", nostalgics or out and out racists. It is the coalition of the three that won and Remain failed miserably to address the only one of those groups that might have been amenable to reasoned argument. Worse than that, it dismissed them as racists and banged on about a prosperity that they never shared in. I know it's not fashionable to fail to blame Corbyn for all the world's woes but he was the only high profile pro-Remain politician who presented an argument that could have worked, ie one that did not alienate virtually every swing voter. Um, there is nothing inherently wrong with grammar schools. This post assumes you can only have Grammar schools with a single 11+ exam design. There are no possible other designs that allow academic individuals to be schooled in a school focused solely upon academic achievement. And that's terrible so no to Grammar schools. Well no. We can easily design a sensible Grammar school system. Firstly the whole test is a massive pain and you do have to spend ages preparing for it. It would be much better if the primary system started to stream earlier and individuals moved up and down between the schools. So you then have a virtual comprehensive system with streaming. But to get anywhere further down the achievement scale you have to spend more resources on the middle layer than you would on the high academic achievement grammar schools. Grammar schools should have class sizes of 40 because you can efficiently teach cleverer kids in that sort of group size. Class sizes up to what you have in university would make it less of a leap. That then allows you to get group sizes down to 15 or lower at the other end of the scale and make a real difference. The failure of comprehensives was simply to merge the academic grammar schools into secondary moderns to make the averages look better. They never fixed the problem. They just masked it. That's the real problem - why did the secondary modern concept fail the middle tier so badly? But despite that the leftist approach of 'all must have prizes' is insane. The Tories have been somewhat critical of the 11-plus exam lately, although I doubt they will do much, but not the funding inversion. You would have thought this was obvious. It's the same division of labour point the Adam Smith made - two specialists combined will always outperform a set of generalists. Your comment might be sensible if the real world was in any way capable of following the policies you propose. Better funding for 'lower stream' schools? Not until more 'successful' parents find their children going to them. The key to the whole debate is 'secondary modern'. I have seen no banners hailing the return of the secondary modern - not even in the Guardian or Mirror. Why not? Every grammar school requires three or four secondary moderns to make it truly selective. Theresa May can waffle about 'no return to secondary moderns' as much as she likes, but until she and supporters agree that this extension of choice is choice for the schools, not the pupils or parents, I'm not listening. And, dear Random, the idea of streaming earlier in primary schools is not one of your best. How soon should we decide that little Wayne is not fit to be educated alongside my Crispin? Maybe we should do it at birth, based on education and income of the mother? The only thing worse, or at least as bad, as the proposed resurrection of the grammar schools is the feebleness of the media in raising the relevant questions. P.S. Could someone please tell the Prime Minister that 'Meritocracy' was meant to be a dystopia! "We are going back to a time where class divisions were far more entrenched than they are now. It is possible that this can be avoided"
What are you talking about? This is delusional rubbish. Have you considered that after 40 years of relative social mobility that those clever enough to go to grammar school come from families where the parents are clever enough to go to grammar school. Genetics determines intelligence and earning potential. So the clever kid from a poor background is now very much the exception. The problem here is idiots that expect every strata of society to match some ideal percentage layout. If comprehensive schools are so good why is there per capita contribution to Oxbridge input so dismal relative to that of private and elite foreign schools who will be viewing this May initiative with some concern? From what I can gather my college is taking fewer from State Sector relative to my GS days. Here's one explanation: some state-school bright sparks are put off by the pomp and ceremony of Oxbridge. I had good grades and was asked if I'd like to apply, but chose not to for that very reason. Years later, I have no regrets. Basically the Labour strategy is to try to force the British people to accept their policies. Not going to work. 'It is not just the Tory party: the British people support the expansion of grammar schools by a margin of two to one, as we found in a ComRes poll for The Independent last month. What this means is that the liberal centre has got it wrong again. You can’t turn the clock back, we say, when that is exactly what most of our fellow citizens want to do, on Brexit, on grammar schools and on returning to an “industrial strategy”." This seems plausible to me. But the unhealthy nostalgia/"they want to turn the clock back" argument can cut both ways. And even people who think of themselves as "progressives" might sometimes support (other) people who want to retain or even return to their traditional ways of life. I have just read Teresa May's piece on grammars for the Daily Mail on their website - an experience which always begs the question whether the Tory press in a few years' time will have dissolved into the Daily Mail's seemingly endless sidebar of what-the-butler-saw for the teenager goggler. "...to set Britain on the path to being the great meritocracy of the world." "...working class people have more control over their lives." "...service of ordinary working class people and building a great meritocracy in our nation." "...faith groups such as the Catholic Church..."
"...a hallmark of a truly meritocratic Britain." She's after the Labour Catholic vote and is using the Blairite language of Meritocracy and New Labour, New Grammars to try to pilfer it. That is an interesting observation, but she is more widely going after the votes of affluent middle class mothers who cannot afford Public School fees but can afford tutors and cramming for an entrance examination, and therefore see a grammar school as a state-funded Public School that gives preferential access to Oxbridge and the Good Jobs. Be fair Simon, the only industry where Britain has a global competitive advantage is sentimental nostalgia – so let's not talk that down too. Anyway 'we're open for business' so there's nothing to worry about. Uh oh - that means we don't have a competitive advantage in anything. "half (48%) of British adults think Grammar Schools are good for social mobility, giving the less privileged a chance to succeed, just one in five (18%) think they are bad for social mobility because they mainly help those who are privileged already." 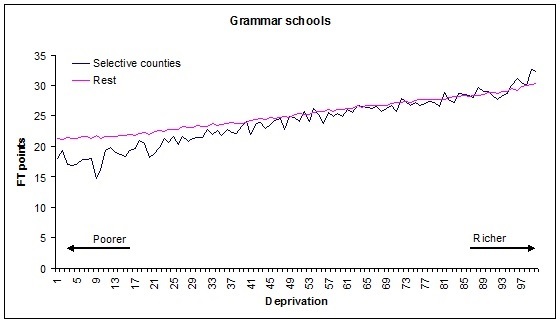 "On that graph we see that those in the poorest areas are the least likely to attend Grammar school." No, that isn't what it says. It's key insight is that poor kids tend to do worse in selective areas than in non-selective areas. A slim plurality of the public don't want any more grammar schools. To get my point fully across and debunk this pseudoscience nonsense. On that graph we see that those in the poorest areas are the least likely to attend Grammar school. See how elistist it is! But of course there is an unstated assumption — which is that the mix of people capable of getting into a Grammar school is equally distributed across the areas. And of course it isn’t. Income is correlated with intelligence and intelligent parents tend to have intelligent children. So the graph is actually telling you that the more intelligent you are the richer you tend to be. If we plotted average IQs we would get pretty much the same shape. So if you live in the real world where people are different, some people are naturally cleverer than others and you realise you can’t turn anybody you choose into a brain surgeon just by applying the correct amount and type of training (ie you reject the ‘gross substitution axiom’ on which mainstream and Marxist economics fundamentally rely) then the graph is easily explained by other means. Or should we ignore the experts Simon? The answer is not what you want to hear. It’s by no means clear cut, but the problem may lie less with the Grammar schools than with the primary schools. Either the Primaries are too focussed upon dealing with other deprivation to encourage the brighter kids into Grammar school, or they are hot housing so hard they discourage brighter kids from poorer backgrounds. Certainly the results show that primary schools are leaving an awful lot on the table when it comes to the poor-but-clever kids. "Income is correlated with intelligence and intelligent parents tend to have intelligent children." You have to be very careful with statements like this. Are these "intelligent children" genetically or environmentally endowed? Humans brains are enormously plastic. As currently measured, the children of intelligent parents may appear to be more intelligent, but that is relatively meaningless unless you think that all children have reached their full potential of intelligence. "I have always felt that the British were slightly obsessed by anniversaries, particularly if it involves anything to do with the two world wars." Don't you think the anniversaries are there to remind people of why the wars were fought? Since 1945 we have had the most benign period since probably the end of Rome. Don't you think it is important to remember both the sacrifice that was made to achieve it and to possibly contemplate what might have happened if things turned out differently? Economists don't like anything that is remotely historical. They like models. That is depressingly well-known. However, if the population forgot this kind of history, and with Brexit and Trump they might just be starting to, we are in real trouble. Agreed. I live in Finland* which regularly tops the PISA standings, yet Gove chose to ape Sweden's failed 'free schools' and May wants to turn the clock back. So much for evidence-based policy. What's more Germany's recent successful reforms are predicated on de-tracking rather than tracking. *97% of schools are comprehensive, selection takes place at 15, i.e. for further education not secondary education. > *97% of schools are comprehensive, selection takes place at 15, i.e. for further education not secondary education. You mean Finland has Grammar schools with a 15+ rather than an 11+? No, I mean children decide on a vocational or academic route at 15 much as they do (or did) at 16 in the UK. If only it were just to the 1950s! Many UK voters want to go back to the 1850s, and even to the 1750s, because they delude themselves they would be "upstairs" as gentry. I can't see the chart! Tried changing web browsers from Explorer to Chrome, but no joy. Sorry about that - it worked on all my available machines/browsers. Does this work now? Agreed. We should be striving for streaming within well-funded comprehensives. May's plan is an unwelcome distraction that threatens to leave many children behind. I sadly missed the Chris Cook piece, so thanks for bringing it to my attention, it's very good. But there's an anomaly in his first set of data, he plots IDACI score and FSM scores, then asserts "So we would expect grammar school areas to do a bit better than average because they are wealthier." however his table shows the North East to be wealthier than London, and we know this is not true. The implication is that there is something wrong with his scoring.